51" w. x 51" h.
Much of my work starts with a nature experience that I photograph. I manipulate it on the computer and transfer it to fabric, then combine it with some surface design such as in this piece, hand painted silk. The work really “takes shape” when I create beautiful shapes within the piece for the up-close viewer. The process of freedom as I draw with my sewing machine is the most satisfying to me. 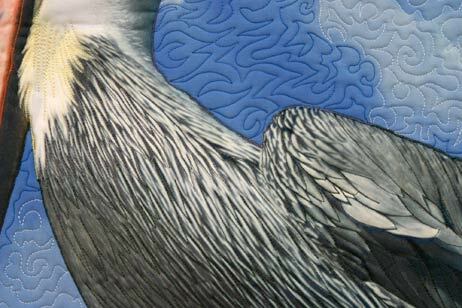 In Perching Pelican, I feel that the shapes of the quilting in the clouds are similar to looking at real clouds continually seeing different images. 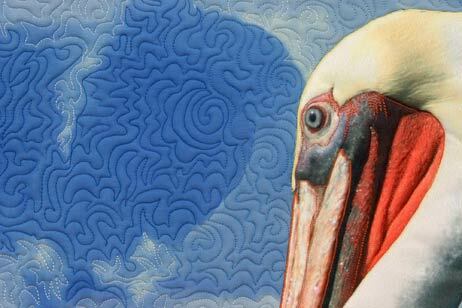 This pelican was photographed in Oceanside, CA when I visited the opening Quilt Visions 2004. 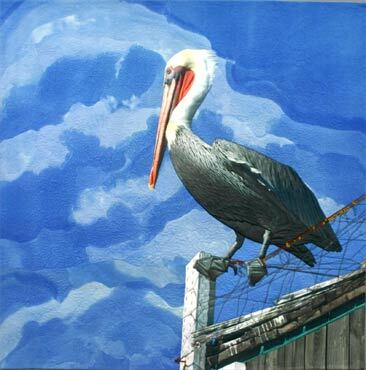 Note the differences between this pelican and those from Hermosa Beach, CA, just up the coast.